To seize everything “at a glance”, the artist created three screens, together 6.66 m long and 2.06 m high. 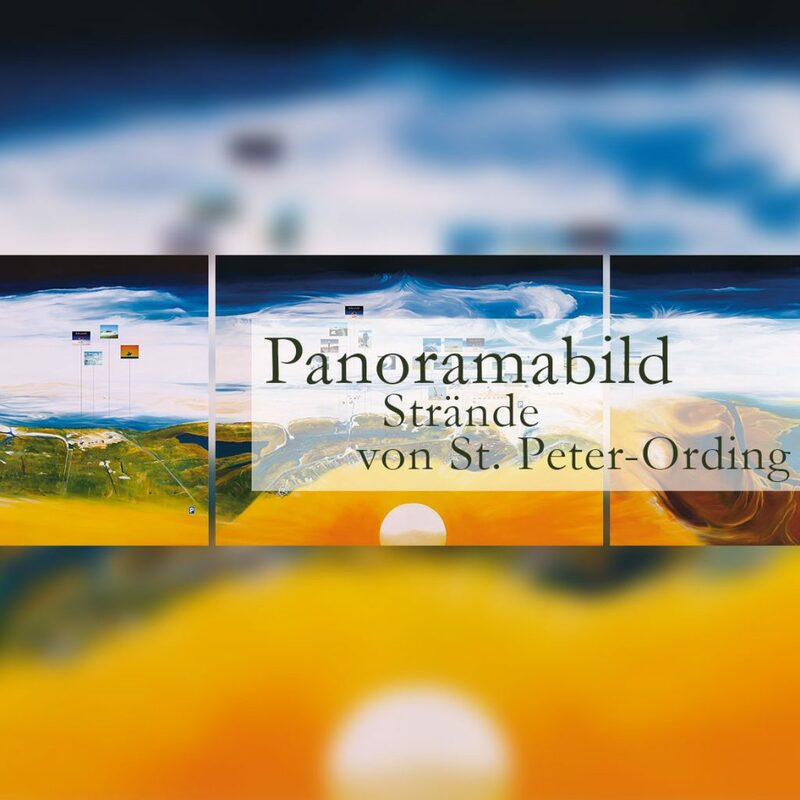 Erhard Schiel imagined to paint St. Peter-Ording and its beach from obliquely above and to let the perspective run into the curvature of the earth. Onto the “blue sky” he then tacked the pictures of the different activities he had painted in the meantime. All our beach sections are different. There are basically four sections of the beach: Böhl, South Beach, Bad and Ording. small children can splash on the bridge at the tideway, catch crabs and if you want to swim at low tide you can walk far to the next tideway over the sand or over the mudflats. Nudism is only allowed in Ording, northwest of the Restaurant “Silbermöwe”. For the driving with the kite buggy and for the beach sailing an area between Ording and Bad is designated, for horse riding an area between South Beach and Böhl. In Ording, there is the so-called “event area”. The best access to this part of the beach you have at the “Köhlbrand” entrance. This all can only be seen from above. Erhard Schiel had the picture already clear, as he explained to the photographer and the pilot of the plane how to approach the beach sections and what photos he needed. Here you can see the difficulties: the photographs had to be made from the same level on the same day – because of the lighting conditions. The photos had to overlap and because our coastline is not straight, the plane always had to approach from an imaginary center. Not difficult? 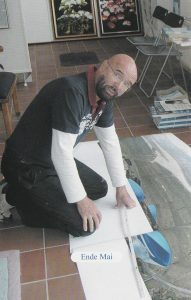 Erhard Schiel began his work early in the morning when it was still cold in his studio. His “incubator”, as his friends call it lovingly, was really meant to be an incubator at midday, this time quite literally, although the windows face north. 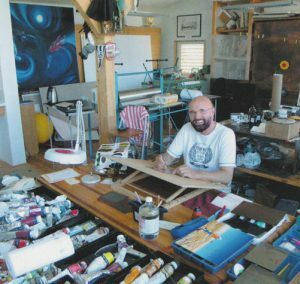 The heat dries the paints, the process of painting is made more difficult. Concentration is required. Because of the aerial photographs Erhard Schiel had to change the perspective for painting on the canvas, always the overall picture and the overall size in his mind. Since the buildings still have to be recognizable, although the more distant ones can hardly be seen anymore, the perspective is correspondingly changed marginally. From the Westerhever to the Böhler lighthouse! Not only the heat, but also the size of the picture takes its toll: Standing, lying … somehow you have to get to the right places of the picture! “At the same time” Erhard Schiel painted smaller oil paintings showing the different pile dwellings, the activities on the beach and different moods- on the right the romping around with the dog and below the wind blowing little foam flakes over the last water film of the outgoing wave, before the water quickly trickles into the sand.